The relocation of expensive or fragile machinery, the re-installation of a complete production line or the relocation of the entire company. Sometimes these kinds of change are necessary to allow you to improve your production and operating processes, but then they have to be done as quickly and efficiently as possible. And of course you don’t want to have to worry about safety for one moment. At Saan we prepare every relocation down to the smallest detail. Your departments and processes suffer as little disruption as possible as a result of our work. With Saan, everything is simply well organised. Whether we are dealing with the relocation of delicate equipment, handling and installing big and heavy machinery or relocating a complete production site, we look after your job from A to Z. You can rely on 120 years of expertise if you arrange for an industrial relocation and leave your project with peace of mind to our experienced staff. Saan’s industrial relocators handle machinery relocations throughout Europe on a daily basis. From single machines to complete production lines, both new and existing machines. From small delicate equipment to big, heavy machines, every job is prepared, supported and implemented with just the same amount of care. We have experience in all kinds of industries. Our clients include renowned companies in the installation technology and food sectors, the medical industry and manufacturing industry. We also take care of the handling and installation of, for example, MRI scanners and graphics machines for machine suppliers. Do you need storage space during the relocation? We can provide that. Your machines and other items can be safely stored on one of our secure storage sites. Our experienced employees are used to supporting very complex projects, from preparation to implementation. We can provide project managers and project staff for these tasks. You have one reliable point of contact for your project. At Saan, we deal with the relocation of production lines, warehouses, workstations, offices, archives and other wide-ranging projects on a daily basis. Here we apply a turnkey project approach and we take the load off you as much as possible. You hand over machinery to us operating and we deliver it to its new location operating again. We have our own in-house engineers so that we can deploy them efficiently on complex relocation tasks to produce site plans and provide lifting plans. In this way we also formulate and produce special handling and lifting solutions and arrange quickly and easily for extra ancillary equipment. If your relocation job requires it, we produce a clear and comprehensible lifting plan. If desired, we also produce a complete safety plan. 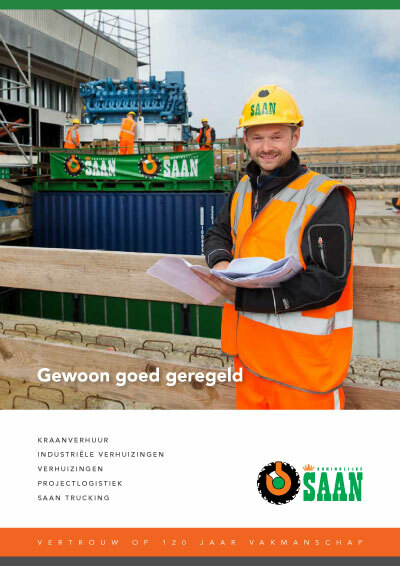 In each case, such a plan consists of a description of the lifting work, a risk assessment and a summary of the measures that Saan is taking to manage the risks. We supply all the ancillary equipment required for relocation jobs. So you can also hire from us cables, work cages, heavy duty clamps, excavation mats and duckboards. Saan takes care of all permissions and exemptions required nationally and internationally for your industrial relocation. Over the years we have built up a big network of contacts with municipalities and provincial governments. So we keep communication lines short, which accelerates the start of the work. We have secure storage sites for the temporary storage of furniture, machinery and other items. At these sites in Diemen, Tilburg and Utrecht you will find both indoor and outdoor storage space. Your goods are securely stored until we take them to their new location. We offer you this storage at a competitive rate. There is a lot involved in a company relocation. In order to avoid as far as possible bringing your production process to a halt, good preparation is crucially important. We take on the job, produce a detailed plan of approach and then present a competitive quotation. During the whole project you have one reliable point of contact, even if we work with specialist partners. For you this means turnkey implementation of the project. You hand over machinery to us operating and we deliver it to its new location operating again. And we do this as efficiently as possible within as short a time as possible. In addition to machine transportation and industrial relocation, we also handle many other transportation/handling and installation projects for our clients. We see each job as a wonderful logistical challenge and always find the best solution. Here we might think of the movement of big and heavy objects in difficult-to-reach locations. Or the relocation of special works of art. We also have experience with the movement of prefabricated elements such as parts of bridges and jet bridges and the transportation and storage of airplanes. We manage each project safely and efficiently from preparation to implementation. For exceptional transport operations or the transportation of heavy goods by road the rule is: we will be happy to look after it for you if we may also support the prior and subsequent phases.